Cheer with us! Facts, fans and stars – we show some aspects of German football culture for the 2018 World Cup. And in our quiz, football philosophers and part-time fans can test their knowledge. Test: Are you a football expert? How well do you know German football? Answer our questions now and find out what type of football fan you are. – There are no wrong answers! ... went down in German history as the "miracle of Bern". ... was possible thanks to the screw-in studs that had just been designed by Adidas founder Rudi Dassler. This gave the German players a crucial edge over the Hungarian favourites on the rain-soaked grass at Wankdorf Stadium in Bern. ... was later interpreted by historians as the emotional birth of the Federal Republic of Germany. ... "After the match is before the match"
... "You have to be eleven friends" – though the original was coined by Richard Girulatis. In 1919, he wrote the book Elf Freunde müsst ihr sein, um Siege zu erringen (i.e. If you want to win, you have to be eleven friends). ... "The ball is round." ... he always played only for 1. FC Kaiserslautern. ... he probably survived the Second World War thanks to football. During a match at a prisoner-of-war camp in Romania, Walter was sent home by the Soviet camp commander, who was a football fan. ... he best liked playing in the rain – or so legend has it. This is because he found it easier to breathe in humid weather conditions after contracting tuberculosis when he was a soldier during the war. ... Hamburger SV remained in Germany's top division for the longest uninterrupted period. It was only in 2018, after 55 years, that this Bundesliga dinosaur was finally relegated for the very first time. ... 1. FC Köln became the first Bundesliga champion. ... Borussia Mönchengladbach and Borussia Dortmund are the most successful clubs, both having been the Bundesliga champions five times. FC Bayern München was only promoted to the Bundesliga in 1965, but then won by far the most often. ... because he secured three World Cups for Germany: he played in the victorious German squad in 1974 and was the team's manager when it won in 1990. As chairman of the Organizing Committee, he also led Germany's successful bid to host the 2006 World Cup. ... because his nickname when he played for Germany was "The Emperor". ... because the way he said "Ja, is' denn heut' scho' Weihnachten?" (Bavarian dialect meaning "What, is it Christmas already?") in a TV advert for a mobile phone provider has become a catchphrase that is now used all over Germany. ... because his many successes more than made up for the "little fat Müller" nickname he was given by his coach Zlatko "Tschik" Čajkovski at FC Bayern München. ... because this midfielder scored no fewer than 68 goals for Germany in just 62 matches between 1966 and 1974. The most important was when he scored the winning goal to put Germany 2:1 ahead in the 1974 World Cup final against the Netherlands. ... because his attempt at a singing career was also a massive success. To this day, his 1974 hit "Dann macht es bumm" is still a favourite at schlager music parties. ... two of them against England. Since its defeats in 1990 and 1996, the motherland of football has developed a full-blown penalty trauma. ... and has won six of them. No other team in global football keeps its nerve as well as Germany does. ... and lost just once because Uli Hoeneß of all people punted the ball into the sky during the 1976 European final. Hoeneß was to achieve far greater success as the manager of Bayern München. ... because he always liked to wear the number 13 strip. ... because his club Bayer Leverkusen came only second in all three major competitions in 2002: in the Bundesliga they came in as vice champions behind Borussia Dortmund, the DFB-Pokal final was lost to Schalke 04, and in the Champions League final Bayer Leverkusen was defeated by Real Madrid. ... because he was injured shortly before the 2010 World Cup yet Germany coped absolutely fine without him at the tournament in South Africa – with the result that Ballack was never again to don the white strip bearing the German eagle. ... that Mario Götze, the goalie who played in the final, would go down in German football history. And yet the highly-talented but injury-prone Götze did not even make it into the line-up for the 2018 World Cup in Russia. ... that for the first time a European team could win a World Cup title despite the tournament being held in South America. ... that the spirit of Campo Bahia had had the desired effect. The German Football Association (DFB) had arranged for this luxury holiday village to be built in the fishing village of Santo André to accommodate the national squad during the tournament. The decision had been somewhat controversial back home – until the team won the title, that is. No trivial pursuit in the world beats football, in your considered opinion. You see all of life reflected in football, with its tactical plays being a metaphor for social upheavals. When Germany crushed Brazil 7:1 in 2014, it was obvious to you that the condition of the Brazilian state was the reason for the disastrous defeat. Only when discussing the finer points of the game do you begin to lose your composure. German football is your life; you are a true fan. Every Saturday you are out there, cheering on your team. You've got bedclothes in your club's colours and can't sleep for two nights when they lose. To calm yourself down, you mutter your team's line-up to yourself over and over again – it's your mantra. 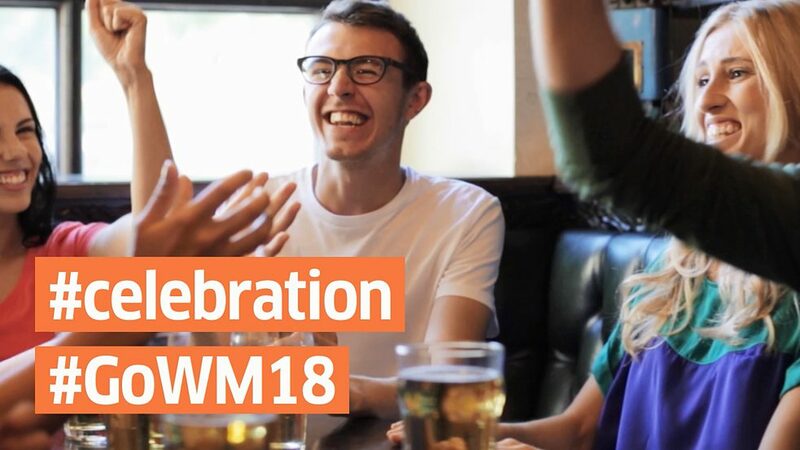 Show us the Celebrations in your City! Fans around the world celebrate the goals of their team. How happy are you? We collect videos and photos of the most beautiful jubilant scenes under the hashtag #celebration – on Facebook, Twitter and Instagram. Russia and the world are in football fever from 14th June to 15th July. Are you ready? Test your knowledge of the World Cup, learn interesting facts from the history of the World Cup and learn football words.